The CompetentRoofer scheme is a Government – licenced Competent Person programme that allows roofers to self-certify their own roof refurbishment work as compliant with the Building Regulations in England and Wales. All jobs have to satisfy these regulations, so if you’re not able to self-certify you’ll need to get the Local Authority to sign your projects off as complete and compliant. The scheme is managed by the National Federation of Roofing Contractors (NFRC) under licence from the Department for Communities and Local Government. Becoming a member is a great way to save time, money and give your customers further assurance of you and your services. Building Regulations are minimum standards for design, construction and alterations to virtually every building. They are developed by the Government and approved by Parliament and are not something you can disregard. If ignored the contractor could face a hefty fine and the cost of putting the work right. As a CompetentRoofer you can sign your work off as compliant and save yourself valuable time and money. Before work on a roof is carried out the local council i.e. the Local Authority Building Control (LABC) must be informed of the intention to carry out work. Details and extent of the proposed work should be confirmed to the LABC within an application to repair/renovate and the fee paid. The LABC will inspect the work periodically to ensure compliance with the Building Regulations and with the drawings/specifications supplied in the application. A completion certificate will be issued at the end of the contract. An approved inspector may be employed to confirm compliance as an alternative to the LABC process. Alternatively using a contractor who is a member of a Competent Person Scheme who can self-certify that their work complies with UK Building Regulations – for example a CompetentRoofer registered contractor. Should the Local Authority Building Control (LABC) become aware of unauthorised work being carried out and the above process has not been undertaken? There is a maximum fine of £5000 for each confirmed case of non-compliance of the regulations and this would fall on the homeowner and/or the roofing contractor. Roof work may be halted if started without the LABC being informed and any work opened up for inspection. If work is carried out without a Building Control completion certificate the homeowner can experience difficulties when coming to sell the house. CompetentRoofer is an accreditation of the contractor’s technical ability to meet the requirements of the Building Regulations. It is quite distinct from trade associations like the NFRC. While both do fantastic work for the industry, with members enjoying all the benefits they bring, you still need to become a member of CompetentRoofer before self-certifying your work. The main membership benefit is that you don’t need to wait for a Local Authority surveyor to inspect the work – saving you both time and money. The scheme covers all roofing types for domestic, industrial and commercial properties and anyone can apply (as long as you’re a roofer!). CompetentRoofer also issues insurance-backed warranty on behalf of its members at no extra cost to the building owner (including breach of Building Regulations and contractor insolvency). What happens when I join Competentroofer? CompetentRoofer is open to all roofing contractors and once you apply for membership a series of checks are carried out. These are followed by an audit of your site and quality management procedures, technical competence and health and safety practices. There’s also an on-site inspection of work in progress. Members are fully vetted and inspected a minimum of twice per year, which gives your clients extra assurance that they’re working with a reputable contractor. Yes. CompetentRoofer offers ease, flexibility and very low cost for notification of roofing refurbishment works. It’s given contractors all over the UK a seriously competitive edge, and saved their customers significant amounts of money and, of course, time. Membership of the scheme also assures your customers that you’re a credible, competent roofing company that provides quality work and peace of mind. 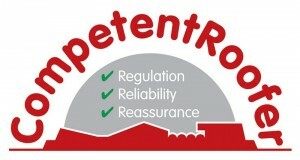 To find out more about how the CompetentRoofer scheme can give you a real competitive edge, visit www.competentroofer.co.uk.